The propensity of the Murdoch press to political partiality is not a new thing: papers like the Sun have been throwing their political weight around since the late 1970s, when the title, having previously supported Labour, switched its allegiance to the Tories, backing Mrs T to the hilt, especially after the appointment to the editor’s chair in 1981 - just in time for the Falklands scrap to kick off - of the less than benign Kelvin McFilth. But even the Sun has been able to retain a sense of proportion over its politics - until this weekend. After Labour leadership front runner Andy Burnham suggested he would not be going out of his way to speak to the Sun - as someone from Merseyside who had stood with the Hillsborough families, he has good reason to do so - all hell broke loose and every available hack has piled in to join the condemnation. First came an intervention on the piss-poor Sun Nation website written by Emer Martin, which was unexceptional, but soon after there was a hatchet job from Trevor Kavanagh, who likes to call union leaders “thugs” - something he got from Fox News Channel (fair and balanced my arse) - while anyone who follows the machinations of the Murdoch empire knows it better suits this journalistic equivalent of “Mad” Frankie Fraser. Keeping up the “Hypocrite” meme, Kav resorts to calling Union leaders “barons”, as if they are appointed by hereditary privilege, while not telling his readers that Union members elect their leaders, while the Murdoch empire appoints its bosses by, er, hereditary privilege. Hence, while Unions have regular elections, Creepy Uncle Rupe goes right ahead and anoints sons Lachlan, and of course Murdoch Junior. 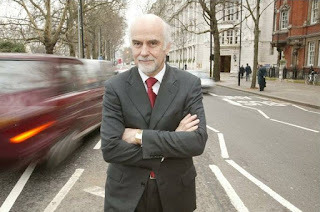 Non-bullying political editor Tom Newton Dunn has forgotten his Keynes: “When the facts change, I change my mind. What do you do, Sir?” The Sun has disrespected the 96 by re-hiring Kelvin McFilth. The paper is unapologetic about its disgraceful past behaviour. All it, and its hacks and supporters, can do is sneer, with deputy political editor Steve Hawkes typical: “if Andy Burnham did speak to us he'd know the price of a litre of petrol”. Even the serially clueless Tim Montgomerie has joined in (but then, grovelling to Murdoch comes naturally to him), whining “There [should] be a prize for [the] silliest pledge during [the]Labour leadership race. I nominate boycotting UK's top-selling paper”. Principles never were Monty’s strong suit, were they? 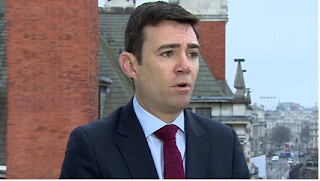 Burnham showing that he sticks by his has clearly hurt the Sun’s bully boys far more than they are prepared to admit. Methinks they do protest too much. When the Sun starts foaming at the mouth and spitting its usual nazi hatred......you know you've got to them. 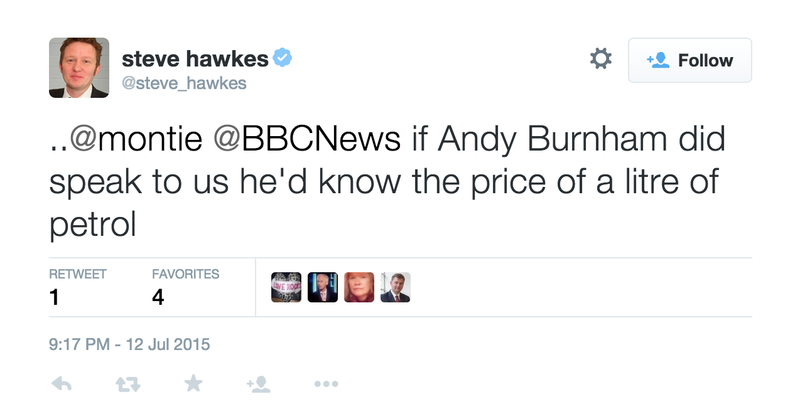 Well in, Andy Burnham. Now get straight in their faces at a time and place of your own choosing. They don't like it up 'em. Watch Kavanagh and his cockney boot boys squeal when they are shown up for the tenth rate School of Goebbels they are. 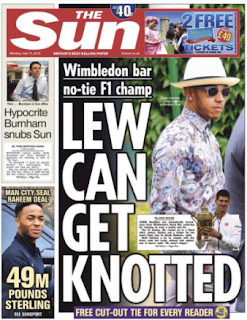 To be fair, only Kendall would ever have given an interview to The Sun. But Burnham has come out and said that he would never do so. The Hillsborough Report will in any case close The Sun well before a General Election in 2020. It will be gone. The blood of the 96 already drips from every page, and from the very lips of Kelvin MacKenzie, who presumably has his bag packed for prison. He certainly ought to have. Burnham was very visible at the Gala on Saturday, kept off the platform but sporting a Prime Minister costume that must have been agony in the heat. The look on his face was unmistakable. "One day," it said, "all this will be mine." 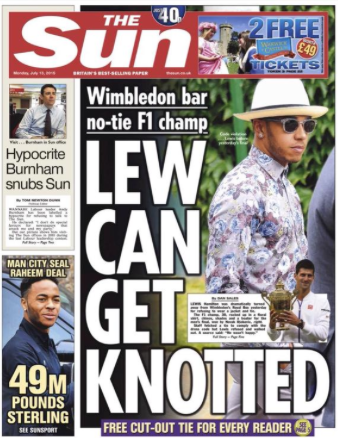 The Sun cannot afford to lose football. But any day now, and certainly during the course of the present Parliament, it will. When no Premier League club, nor the England national team, will have anything to do The Bloody Rag of Hillsborough, then that will be damaging enough in itself. But it would not end there. The network of WAGs and other associates stretches deep into popular culture generally.